Lulu Reinhardt and Han’sche Weiss are arguably the two most important guitarists from the German style of Gypsy jazz. They both played extensively with the great German Gypsy violinists Schnuckenack Reinhardt and Titi Winterstein. Han’sche later moved onto more modern bebop style jazz which he still performs to this day. Lulu Swing is perhaps one of the most famous compositions from the German school of playing. It is based on the chord changes to Billy Strayhorn’s Take the A Train and has been recorded by many of the great contemporary performers of Gypsy jazz. Posted by Michael Horowitz on July 30, 2005 at 11:15 pm in Audio.Comment on this post. Fapy Lafertin has a reputation as being one of the more sophisticated and expressive guitarists in the Gypsy jazz genre. He eschews the ultra fast tempos and flash of the younger generation. Instead, his music is light and melodic. These qualities are clearly evident in a series of rare recordings he did with his uncle Bamboula Ferret. Bamboula spent his life in France playing popular songs and Gypsy music on the guitar and violin. He is also a charming vocalist. Although he was a highly respected musician, he never recorded. To preserve his musical legacy, Fapy used his home studio to make a series of recordings of him. Fapy overdubbed all the guitars and bass himself. Take note of Fapy’s traditional approach to the la popme rhythm. It’s light and bouncy, unlike the more modern styles heard today. Bamboula is singing and playing violin. For more Fapy Lafertin check out his CDs Fleur Dennui ,Fine and Dandy, and Swing Guitars. Posted by Michael Horowitz on May 29, 2005 at 1:35 pm in Audio.Comment on this post. 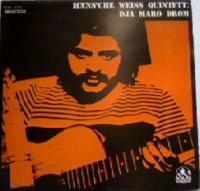 In the south of France during the 1950s and 1960s, a generation of Gitan guitarists was also playing their own brand of Django’s music, blending in Corsican and flamenco influences and recording for several small labels in southern France and Lyon. Because they were able to record during this era of the lost generation, their music became influential in keeping Django’s legacy alive and in passing on a southern Gitan style. The most influential was Etienne “Patotte” Bousquet. Performing at the infamous Marseille dive Au Son des Guitares, Bousquet played with such ferocity that he at times broke all six strings with one strum of his plectrum. His music was based in Django’s legacy, but also incorporated musette waltzes and Corsican melodies. He recorded a handful of EPs and LPs that kept songs such as Django’s “Montagne Sainte-Geneviève” from being forgotten. In later years, Bousquet gave up on life as a musician and became a shoe vendor in the Midi’s flea markets. Django was from the Manouche or Sinti tribe of Gypsies. The Sinti have their roots in Eastern Europe. They have a distinct language and musical traditions. 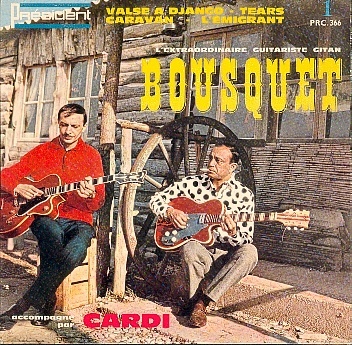 Bousquet, along with the Ferret family and many other famous Gypsy guitarists, are from the Gitan tribe. The Gitan have roots in Spain. They speak a different language then the Sinti and have Spanish influenced musical traditions. This recording of Bousquet shows the Latin side of Gitan music. L’Emigrant is a popular flamenco standard which Bousquet interprets in the neo-flamenco style of the Gitan. Jimmy Rosenberg was a child prodigy who could play some of Django’s most difficult solos by the tender age of 10. He has gone on to become one of the most technically proficient and creative Gypsy guitarists of this generation. This rare Gypsy Kings influenced Latin style recording shows Jimmy’s incredible proficiency. He was around 16 when this was recorded. For Video of Jimmy see: Gypsy Jazz Jam DVD and Django Legacy VHS. Posted by Michael Horowitz on May 29, 2005 at 1:08 pm in Audio.Comment on this post. Posted by Michael Horowitz on April 1, 2005 at 4:08 pm in Audio.Comment on this post.